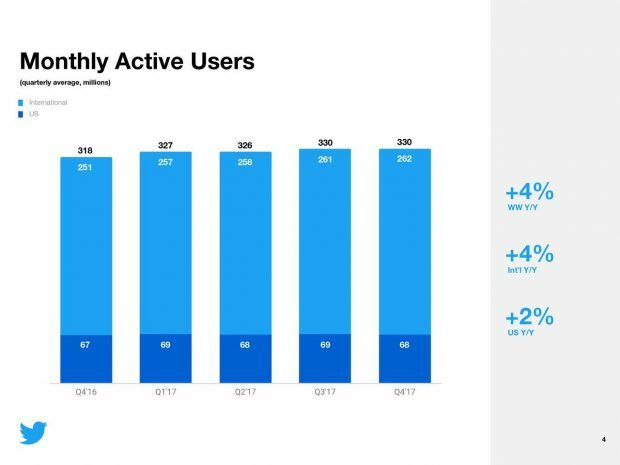 Twitter’s total number of monthly active users showed no increase from the previous quarter, but its overall revenue certainly did. Despite a stagnant number of monthly active users – 330 million to be exact – Jack Dorsey, Twitter CEO described the quarter as a “strong finish to the year,” referring to the company’s reported fourth quarter revenue of $732 million, an increase of two per cent year-over-year. “We returned to revenue growth, achieved our goal of GAAP profitability, increased our shipping cadence, and reached five consecutive quarters of double digit DAU growth. I’m proud of the steady progress we made in 2017, and confident in our path ahead,” he said during an earnings call. Owned and operated advertising revenue also jumped seven per cent year-over-year, and of its overall fourth quarter revenue, represented $644 million. Countries outside of the U.S. advertised more with Twitter last quarter, compared to third quarter 2017. Advertising revenue internationally hit $302 million, a $63 million increase for the quarter and an 18 per cent increase year-over-year. Ned Segal, Twitter CFO said the jumps in ad revenue can be attributed to “strong engagement growth, improvements in our revenue products, improved return for advertisers, and better sales execution.” There were more than 1,140 live-streamed events on Twitter during its fourth quarter, and 22 new partnerships, according to Twitter’s letter to shareholders. The company also said its data and enterprise solutions gained a lot of traction, thanks to its new tiered product and channel strategy which introduced a “significant number” of new enterprise deals in the fourth quarter.